Mat Fox, John Moriarty Football Head Coach-Mentor, Borroloola, NT. Getting to the remote Aboriginal communities of Borroloola and Robinson River is anything but convenient. A jaw dropping 3,220km from my home town of Newcastle, the small township lies 1,000km south east of Darwin, nestled away near the Gulf of Carpentaria. This is country with a little over a thousand people between two communities. The 2016 Census says Robinson River has a population of approximately 280 people, Borroloola 950. The nearest Woolworths and Coffee Club stores are over 650km away, and require driving over 350km along the Carpentaria Highway, which is a single lane. Yes, a single lane highway, if a vehicle is approaching the other way you need to pull over to let it pass. The neighbouring community of Robinson River is another 140km south east, accessible only by 4WD via a dirt road, and with a number of river crossings along the way. Before making the journey, I did intensive 4WD training. As I wind down my windows and check for crocodiles before piloting across the river, my satellite phone is handy should anything go wrong. A far cry from cruising down the Pacific Highway in cruise control, with my caramel latte in the cupholder of the dashboard. The scenes as first I arrived are hard to describe, the only thing I can compare it to are the communities that I have visited in developing Central American nations, like Honduras and El Salvador. It’s like living in a different country. It is different country, it’s Yanyuwa and Garrawa country. There are different languages spoken, even English is spoken with an accent and different vocabulary, there are different sets of rules, and a vastly different culture. John Moriarty Football was recently nominated as one of the three finalists for the 2018 FIFA Diversity Award for the work we do, using football to spearhead positive change. Not only does JMF run football programs, it also provides meals, with coaches preparing fruit and a nutritious meal at every session, along with employment, guidance and mentoring for young adults, and scholarships for young players to further their education. John Moriarty of course, of the Yanyuwa people and born in Borroloola, became the first Indigenous Australian to be selected to play football for Australia in 1960. 17 year old Shay Evans is an example of the talent that abounds in these communities. Scouted by current Westfield Matildas Coach Alen Stajic at the age of 13, Shay made her first appearance for the Young Matildas in 2018 after moving to Sydney to attend Westfield Sports High on a JMF scholarship at 14. The fact that one player from these communities has played representative football for her country is a feat comparable to the incredible footballing success of nations such as Iceland and Croatia, which has sparked recent discussions on development amongst the football world. 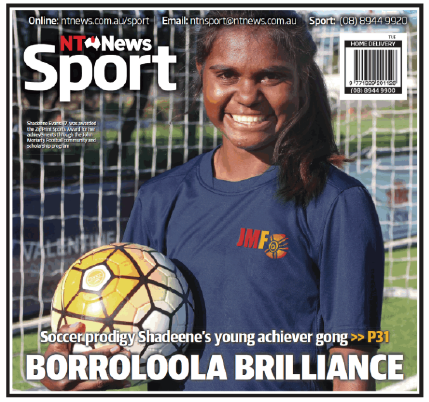 Many other kids from Borroloola and Robinson share Shay’s talent, and her story. Playing street football with bare feet every day until the sun goes down, every spare minute is spent outside playing. Last week I witnessed two pickup games being played at the local park in Robinson River, one an AFL game, and the other a football game, and both went until the last ray of light was left in the day. As Tupac Shukar played out of a portable boombox that one of the boys brought along, there wasn’t a coach or adult in sight, and yet the games were facilitated perfectly. Teams were arranged to fit a seven year old and fourteen year old playing on the same field, and boys played against girls. There were no bibs, no boots, just a ball and the kids’ surroundings. Pele’s autobiography came to mind as I was watching, and his story of playing unorganised ‘street football’ with bare feet for much of his childhood, before developing into one of the greatest players of all time. The stories of Messi, Ronaldo, Neymar, and many of today’s world class footballers are all the same: attributing street football and futsal to the development of their football ability as a young player. Similarly the 2013 documentary ‘Concrete Football’ shares the culture of street football in the urban suburbs of France, with the likes of Ousmane Dembélé, Riyad Mahrez, and Kylian Mbappé all graduating from a ‘street football’ beginning to the elite of world football. Can this street football culture be easily replicated or implemented within Australian suburbs? Hardly. It is a culture, which is something not simulated easily. No matter where you are, street football has one thing in common. Poverty. Far from the distractions of smartphones and tablets, and from the convenience of large TV screens and shopping centres. Most kids play street football not just for enjoyment, but also out of necessity. They cannot afford shoes, nor the luxuries of appliances. And being on the street is often a better environment than being at home. As Australia searches for ways to compete with the football powerhouses of Brazil, Argentina, Spain, and France, they all have something that we don’t. Or do they? In Australia’s remotest places, football is being played endlessly on dirt roads, and on the pavement. Creativity, flare, and personal expression are the essence of every attacking movement. Competitiveness doesn’t dwindle, the hunger to win never dies down. Is a street football culture the only answer to development? Certainly not. I am a firm believer that the most successful strategy to being the best is adaptation, and that as soon as the ink has become dry on the latest curriculum it’s already out of date. Street football is only part of the solution, but one that is largely underestimated and under resourced. I know first hand that something worth investing in is football within our Aboriginal communities, where street football is alive and well. Quite possibly, the answer for Australia’s search for attacking and creative-minded players is right in our own backyard. Thousands of kilometres away from the nearest town, hundreds of kilometres down a dirt road and across a couple of rivers. It’s found in different country, within our own country. While much has been said of football’s lack of investment in Aboriginal talent compared to other sporting codes such as AFL and Rugby League, the old saying rings true: “the secret of change is to focus all of your energy, not on fighting the old, but on building the new.” So, enter the Moriarty Foundation, who took it upon themselves almost seven years ago, to develop the natural talent that awaits in Indigenous communities. 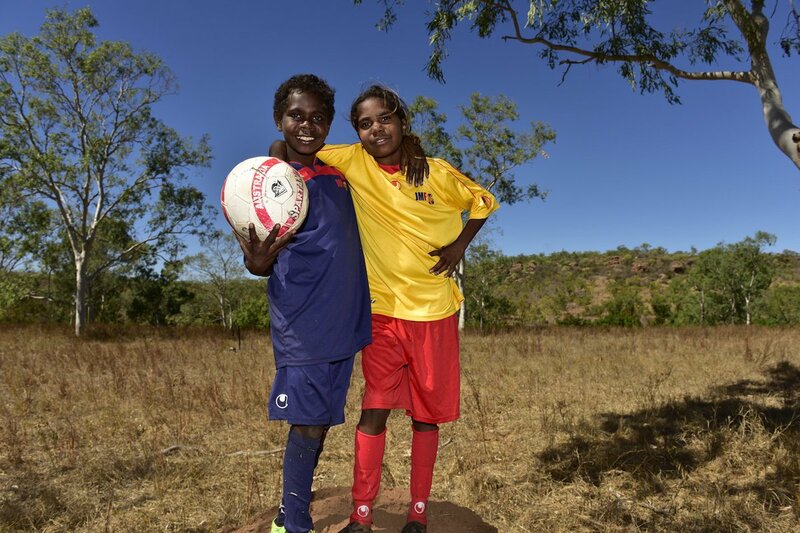 What can the rest of us do to support Aboriginal football? You can do what I did, and become a JMF Coach to see and develop this talent yourself in remote communities around Australia. You can make donations to the Moriarty Foundation, send footballs and other equipment to support the program. You can do what Westfield Matildas Head Coach Alen Stajcic did, and visit the community to scout local talent, then tell the world about it. Or simply follow us and join the JMF story. For the kids, for their families and for football. Mat Fox is a FFA/AFC C-Licensed coach who has previous experience in coach education and as a skill acquisition coach for players identified in the talented player pathway. Mat moved to Borroloola in 2018 to combine his passion for mentoring at-risk youth and coaching football.